Here is the list of the hotels near Mellé. Book your hotel near Mellé today, Thursday 09 May for the best price, reservation and cancellation free of charge thanks to our partner Booking.com, leader in on-line hotels reservation. Below here is the list the 50 closest hotels of Mellé, sortable according your criteria. You will find the position of these accommodations on the Melle hotels map. Located in Saint-Brice-de-Landelles in the Lower Normandy Region, 31 km from Le Mont Saint Michel, Maison calme et campagne boasts a barbecue and views of the garden. Free WiFi is available and free private parking is available on site. Located in the owners' home, certain units include a seating area for your convenience. Rooms have a shared bathroom equipped with a bath. A shared kitchen with a coffee machine, a microwave and a dining area is available. A shared living with a flat-screen TV also is at guests' disposal. Granville is 48 km from Maison calme et campagne, while Avranches is 23 km from the property. The nearest airport is Rennes Airport, 72 km from the property. Located in Saint-James, 19 km from Le Mont Saint Michel, La Maison d'Isaphil boasts a sun terrace and views of the garden. All rooms come with a private bathroom. La Maison d'Isaphil features free WiFi . You will find a shared lounge at the property. Meals prepared by the hosts can be enjoyed at an extra cost if you reserve in advance. The area is popular for cycling and hiking. The bed and breakfast also offers bike hire. Cancale is 43 km from La Maison d'Isaphil, while Granville is 41 km away. The nearest airport is Dinard Brittany Airport, 56 km from the property. The Normandie Hotel is located at Saint James, on the border between Normandy and Brittany. It is offers en suite accommodation free Wi-Fi internet access and a TV. Breakfast is served daily and the Normandie’s restaurant offers traditional cuisine with seafood dishes. Guests are also invited to relax in the bar. 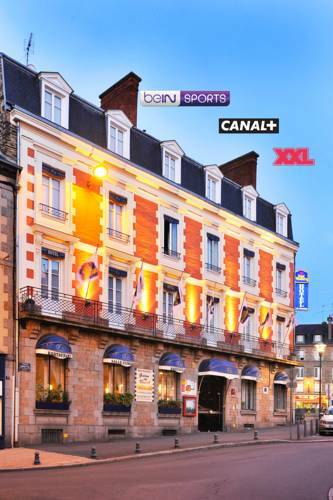 The Hotel Normandie is next to the Beuvron River and a 5-minute drive from the A84/ E03 motorway. Le Manoir du Jardin is set in Saint-Hilaire-du-Harcouët. The property features lake and garden views. The holiday home is composed of a living room, a fully equipped kitchen, and 4 bathrooms. Le Mont Saint Michel is 41 km from the holiday home. The nearest airport is Dinard Bretagne Airport, 84 km from the property. Situated in Virey in the Lower Normandy region, Chambre d'hotes La Jaunais features a garden. The accommodation has free WiFi. The bed and breakfast is equipped with a flat-screen TV. A continental breakfast is available each morning at the property. The bed and breakfast offers a terrace. Hiking can be enjoyed nearby. Le Mont Saint Michel is 36 km from Chambre d'hotes La Jaunais. The nearest airport is Dinard Bretagne Airport, 79 km from the accommodation. Maison des Isles is set in Saint-Hilaire-du-Harcouët, 25 km from Avranches. All rooms include a TV and a private bathroom. There is a grocery store next to the property, where you can buy local products and wines. A pilgrimage trail leading to Mont Saint Michel is 1 km from the property. Activities such as minigolf, bike rental and boules court are available nearby. Saint Symphorien des Monts Animal Park is 9 km away. The nearest airport is Dinard Brittany Airport, 82 km from Maison des Isles. Set in a 19th-century building on the banks of the River Sélune, this 3-star hotel features a heated swimming pool in the garden. Free Wi-Fi is provided in the guest rooms. An LCD TV with Canal+, and tea and coffee making facilities are included in each room. They offer views of the garden and the terrace. Local cuisine is served in the restaurant, and is accompanied by wines from the hotel’s wine cellar. You can enjoy drinks in the bar, and a buffet breakfast is prepared every morning. The centre of Saint-Hilaire-du-Harcouet is a 4-minute walk from the hotel and free public parking is available nearby. The city of Avranches, overlooking the bay of Mont-Saint-Michel, is 25 km away. Located 11 km from Isigny-le-Buat, Le Jardin B&B offers self-catering accommodation, a continental breakfast, outdoor swimming pool, garden with furnished terrace, and free Wi-Fi. It is 20 km from the Mont St Michel. The houses at Le Jardin B&B feature a seating area with a sofa and a flat-screen TV with satellite and cable channels. The 2-bedroom house has a private bathroom with bathtub and shower and the 3-bedroom house has a private bathroom with a shower The fully-equipped kitchens have a dishwasher, refrigerator, oven, coffee machine and electric kettle. A continental breakfast is served daily and there are restaurants 2 km from the property. Nearby outdoor activities include hiking and biking, and kayaking is possible 20 km from the B&B. Free private parking is provided on site. Situated in Saint-Hilaire-du-Harcouët, Hotel De L'Agriculture features a terrace and bar. The on-site restaurant serves French cuisine. All guest rooms in the hotel are equipped with a TV. A continental breakfast is available daily at Hotel De L'Agriculture. Le Mont Saint Michel is 31 km from the accommodation, while Granville is 47 km from the property. Dinard Brittany Airport is 73 km away. Offering an à la carte restaurant, Hotel Restaurant Le Lion d'Or is located in Saint-Hilaire-du-Harcouët. Free Wi-Fi access is provided and a continental breakfast is prepared every morning. Each of the modern rooms is individually decorated and will provide you with a flat-screen TV with satellite channels. Some rooms offer a garden view, and the private bathrooms are complete with a hairdryer and free toiletries. At Hotel Restaurant Le Lion d'Or you will find a large, tree-lined park and a bar lounge. Other facilities offered include a shared lounge and bike rental. The property offers free private parking. Situated in Isigny-le-Buat in the Lower Normandy region, La Chaumiere features a terrace and garden views. The property was built in 2001 and has accommodation with a balcony. This holiday home has 2 bedrooms, a kitchen, a flat-screen TV, a seating area and 1 bathroom. Le Mont Saint Michel is 28 km from the holiday home, while Granville is 43 km away. The nearest airport is Dinard Bretagne Airport, 72 km from LaChaumiere. Situated in Moulines in the Lower Normandy region, Two-Bedroom Holiday Home in Moulines is a 3-star property boasting free WiFi. Guests staying at this holiday home have access to a fully equipped kitchenette. Le Mont Saint Michel is 46 km from the holiday home, while Avranches is 34 km away. The nearest airport is Rennes Airport, 87 km from the property. Set in Vergoncey in the Lower Normandy region, La Moire is a 3-star property featuring free WiFi. The accommodation is 19 km from Le Mont Saint Michel. The holiday home includes 3 bedrooms and a living room with a TV. The kitchen has a dishwasher and a microwave. Granville is 45 km from the holiday home, while Avranches is 18 km away. The nearest airport is Dinard Bretagne Airport, 62 km from the property. Ferienhaus Chalandrey 400S is situated in Chalandrey. Guests staying at this holiday home have access to a fully equipped kitchen. Le Mont Saint Michel is 32 km from the holiday home, while Granville is 46 km away. The nearest airport is Dinard Bretagne Airport, 75 km from Ferienhaus Chalandrey 400S. Situated in Chalandrey near Isigny-le-Buat in Normandy, Les Basses Beaulinges is a converted cider barn offering cottage style accommodation with a private terrace and garden with views of the surrounding countryside. Guests can enjoy the open plan ground floor which features a lounge, TV and dining area complete with traditional oak beams and a modern kitchen fully equipped kitchen. Additional facilities include a BBQ and free WiFi. All rooms are fitted with a wardrobe and feature original stone walls. The private bathroom includes a bath, shower and toilet. Les Basses Beaulinges is close to the Normandy/Brittany border and guests can take trips to places of interest such as Le Mont-Saint-Michel which is 35-minutes’ drive from the cottage. Other places of interest include the seaside town of Granville, 50 minutes away. Both the Dinard-Bretagne Airport and Saint-Malo are 1-hour’s drive from the cottage. Gîte de la baie du Mont St Michel is set in Juilley. Guests have a private terrace. This holiday home is fitted with 4 bedrooms, a flat-screen TV, a dining area, and a kitchen with a dishwasher and an oven. The holiday home offers a barbecue. Guests can also relax in the shared lounge area. Le Mont Saint Michel is 19 km from Gîte de la baie du Mont St Michel. The nearest airport is Dinard Bretagne Airport, 62 km from the accommodation. Located in Argouges, Bijoux Gite offers a seasonal outdoor swimming pool. With barbecue facilities, the property also features a garden. The accommodation features free WiFi. The units at the guest house come with a flat-screen TV and a kitchen. A seating area is available in all units, while certain rooms have a DVD player. All rooms will provide guests with a desk and a coffee machine. Bijoux Gite offers a children's playground. Le Mont Saint Michel is 22 km from the accommodation. The nearest airport is Dinard Bretagne Airport, 62 km from Bijoux Gite. Bed and Breakfast Parigny Preferred hotel ! La Datiniere offers accommodation with a garden and free WiFi, and is set in Parigny. A continental breakfast is available every morning at the property. Cycling can be enjoyed nearby. Le Mont Saint Michel is 43 km from the bed and breakfast. The nearest airport is Dinard Bretagne Airport, 86 km from the property. Bed and Breakfast Vergoncey Preferred hotel ! Set in an 18th-century château registered as an historic building, this B&B is located a 15-minute drive from Mont St Michel. The tree-lined park features a pond and you can play billiards in the games room or take a swim in the pool. Decorated with antique furniture and Louis XVI-style paneling, each guest room offers a view of the park. Free WiFi access is included and a bathrobe and free toiletries are provided in the en suite bathroom. You can enjoy a continental breakfast in the spacious dining room at the Château de Boucéel, while admiring the view of the park. Upon prior reservation, guests can enjoy evening meals in the property's courtyard, 50 metres from the main building. Private parking is free on site and the D-Day beaches of Normandy are 90 minutes by car from this bed and breakfast. Exit 34 on the A84 motorway is a 10-minute drive away. Located in a picturesque and rural setting in the Normandy region, La Chevallerie is located in Chalandrey, just 3.5 km from the centre of Isigny-le-Buat and 28 km from the Mont Saint-Michel. It offers free Wi-Fi access, a terrace with outdoor furniture and a flowered garden. The property includes 2 bedrooms located on the ground floor. Each has its own private bathroom fitted with a shower and a toilet. Restaurants can be found in Ducey, which is 8 km away. This property is 17 km from Avranches and 27 km from Pontorson. The A84 motorway is 12 km away and free private parking is available on site. This former mill is situated on the banks of the River Sélune and only a 30-minute drive from the abbey at Mont-Saint-Michel. Free Wi-Fi access and a flat-screen TV with satellite TV are provided in all rooms. 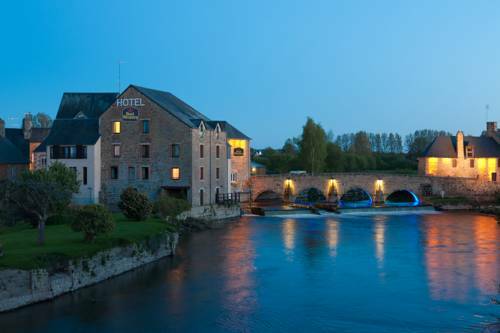 Most of the rooms at Best Western Le Moulin de Ducey look out on the Sélune River. All rooms have a minibar and facilities for making hot drinks. A free bottle of water is provided on arrival. A buffet breakfast is served every morning in the dining room, which offers river views. Guests can also enjoy dinner on site. There is a bar at Best Western Le Moulin de Ducey and regional products can be bought at the property. You can enjoy numerous walks or bicycle rides from the hotel. Avranches is a 10-minute drive away. Free private parking is provided at the Best Western Le Moulin de Ducey. The Auberge de la Sélune is a country hotel located in Ducey, just 20 km from the Mont-Saint-Michel and beside the Sélune river, one of the last salmon rivers in France. The hotel features an onsite restaurant and offers an e-bike rental service. Each room is provided with bed linen and a free WiFi connection is available. The restaurant dates back 4 generations and is known for its salmon fishing tradition. At the restaurant, you will appreciate the traditional cooking of local products, especially the numerous varieties of local fish. The hotel guests have at their disposal the terrace with the flower garden by the river which provides wonderful colour throughout the seasons. Below here is the hotels map of Mellé. Names and details of Mellé hotels can be shown on the map clicking on the prices icons.